Looking at these bible verses we see that the Gift of Intercession is not mentioned. Does that mean that it’s not a spiritual gift? No. What we do see is that in intercession we use many of the other gifts listed in the scriptures. We are all commanded by God to pray but we know that some Christians actually have a gift of Intercessory Prayer. Just as we are all commanded to share the Gospel of Jesus Christ with everyone but some Christians have the gift of evangelism which makes it easier for them to carry out this command. What is intercession? Simply put it is praying for others. Praying to God about others. Many times when we pray we tend to focus on ourselves but a true intercessor usually focuses on others. How do you know if you have the Spiritual Gift of intercession? Well, as with the other spiritual gifts this is not something you can control. You either have it or your don’t and the sign of the gift is the fruit of its use. Here are a few things that you will see within yourself or others who have this gift. You have a deep concern for certain regions or areas that other don’t seem to notice. Do you know someone who is constantly asking you to pray for something that you don’t feel a particular interest in? For example, they always want to pray for the government. Not that this is not an important area to focus on but this is their constant request. That is usually a sign that they have been given the assignment from the Lord to pray for the government. You have compassion to the point of tears for persons or places that have no direct connection to you. You have knowledge about persons or places that are not directly connected to you. You have an ability to related to people or places that are not directly connected to you. You get lost in prayer and can pray for a much longer period of time that most. The first thing that you do or think when you hear about a problem is pray. When you pray words come out of your mouth with information that you didn’t know you knew. You are very sure within your heart that when you pray for certain things the prayer is being answered instantly. You are happy to pray for others and consider it a honor that they would ask you. You sometimes experience an emotional or even physical pain for others when praying for them. And the most important trait is that things happen or answers to prayers come very fast when you pray. These are just some of the signs that you may have this gift. Looking at points you’ll see that during intercessory prayer you are actually using many of the spiritual gifts that are listed in the spiritual gifts list from the bible. You are using the gift of faith when you know that the prayer request is being answered immediately. You are using the gift of miracles when you believe for the impossible things . You are using the gift of a word of knowledge when you know things about certain situations that you have no way of knowing other than the Holy Spirit himself gave you revelation. The compassion you feel is the gift of mercy at work. So intercession actually employs many of the other spiritual gifts. If you read this list and you’ve identified many of these traits within yourself, what do you do with it? Well, consider yourself privileged because you are about to partner with God – The Father, The Son & Holy Spirit to do some amazing things for the Kingdom of God. You’ll have an intimacy and understanding of the heart of mind of God like no other. You need to guard this and keep yourself from being tainted, defiled and used by others who would prostitute the gift for evil or their own selfish gain. Pray and ask the Lord what He would have you pray and who you should connect with. Your greatest teacher and mentor in the gift is the Holy Spirit himself. He will guide you on what to pray. If you read the bible and worship through prayer and praise he will continue to grow you up in this area and mature you in this gift. The greatest benefit is having intimacy with God. You’ll have a clear understanding of the heart and mind of Christ on certain issues. He will reveal things to you that He may not necessarily show to others (2 Kings 6:8-12). You will have the ability to affect the lives of others in a positive way that live miles away in other continents. People may never meet. You get to partner with God in creating change. How amazing is this? As you pray for others and see their success you will also experience tremendous joy because you know you were instrumental in making that happen. While you are praying for others God in turn will begin to answer your own prayer requests. This doesn’t mean that you should never pray for your own needs it just means that you will notice that your own prayer requests are being automatically answered. It’s almost as if the Lord begins to reward you for your service to Him by answering your prayer requests. You will develop a heart of gratitude. When you get a look at other peoples burdens your own problems will become miniscule in comparison. Intercession is actually a doorway to many of the other spiritual gifts so God can actually activate many other gifts within you when He choose to do so for His glory. You’ll change. True intercession is praying the will of God. If and when you pray something or think about praying something that is not His will, you will instantly know it. As a result, you’ll change your prayer request and then your prayer will be answered. A prayer prayed under the influence of the Holy Spirit and according to God’s Word is one that is answered 100% of the time. When your request conforms to His will it will be answered so you’ll notice that you are the one who changed. God didn’t change His mind, He changes you and your request to line up with His will. 95% of the things that God will reveal to you is just meant for you to pray about it . It’s not to be shared with others. Don’t be a blabber mouth or God will stop showing you things and use someone that He can trust. Imagine if you had a friend and every time you tell them something they run and tell everyone else, the information could end up in the wrong hands or someone could get seriously hurt. Eventually you would just stop telling them anything, right? Same thing with God – He’ll stop telling you if you don’t know how to keep your mouth shut. If you feel the need to share what God has shown you, be sure to ask the Lord before you do it. People may not be in the place spiritually, emotionally or mentally to receive what you will share with them. Most of what you do will be in secret. I’m convinced that the rewards for the intercessors in heaven will be great because they are doing so much in the body of Christ and no one knows about. Guard your gift and keep your eyes open for others who having discovered that you have the gift will try to use you to get what they want because they can’t get it through their own prayers. If you get a check in your spirit about a certain individual or group, disassociate yourself. Remember that you are operating in the spiritual realm when you go into intercession so be careful and don’t take on assignments that God has not specifically told you to do. You could put yourself in danger and cause the enemy to retaliate and attack you. Pray before you take on assignments. There’s no shame in stepping away from things that you feel you are ill equipped to handle. Better to be safe than open the door for some attack on your physical body that came about because you stuck your foot where it didn’t belong. While other intercessors can help to mentor you in the gift, there is no greater teacher than the Holy Spirit (1 Corinthians 2:13). Your mentor can only teach you what they know and they don’t know everything! (1 Corinthians 13:9) God may teach you something that He hasn’t taught them. Be careful not to become self righteous because you now have wisdom and knowledge about certain things that others don’t. Remember that you have the insight for a specific purpose – to pray. Others may not carry the same burden because God has not laid this on their heart and may appear disinterested. It doesn’t necessarily mean that they are not connected to God. It just means that that burden is for you and not for them. We hope that this article has helped you. Let us know in the comments below if you have questions about this gift and we’ll try to answer them. 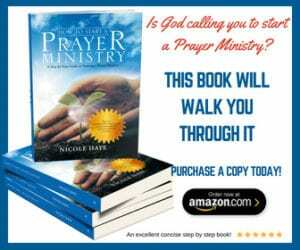 As an intercessor, this article has been of great help to me. Thank you and God bless you abundantly! This article was so much confirmation and revelation on tonight! I will keep this article for my notes! My God! I truly needed to read every word. It’s like a reminder manual of what’s to come and how to be careful while operating in this gift. What an awesome article. So much revelation to me. God Bless! Thank you. This article wa extremely helpful by providing much clarity. God Bless you.